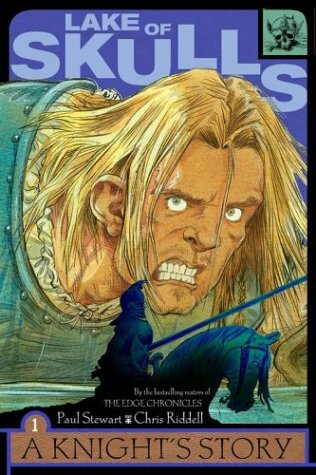 Lake of Skulls: A Knight’s Story is the first in another series by Paul Stewart and Chris Riddell, perhaps better known for The Edge Chronicles. They have also collaborated on the thrilling–sometimes terrifying–Barnaby Grimes series and one of my new favorites, the delightfully hysterical fantasy of Muddle Earth. This particular story is narrated by a “free lance” knight, meaning he does not work for one particular king or wealthy master. He travels instead from place to place on his horse, Jed, participating in various village jousts and tournaments. In this way he earns his living. In Lake of Skulls our hero comes upon a town run by and unpleasant-looking (and smelling) lard. (Our knight dubs him Lord Big Nose.) Although he would prefer to bypass the town, one of Jed’s horseshoes is loose. This must be fixed and the next town is too far away. He seeks overnight shelter for himself and his horse. In the tavern Lord Big nose, along with his crossbow-laden guards, strikes a bargain wherein our Knight will travel to an island in the Lake of Skulls and retrieve the enchanted crown that sits there atop a mountain of skulls. The Knight’s quest and its consequences are related at breakneck speed, barely pausing in suspense long enough to breathe. Like their Barnaby Grimes series, Stewart and Riddell ride the line of gruesome in masterful fashion. There is just enough detail to be creepy and a LITTLE scary, but not so much as to give one nightmares. If you like stories of knights and battles, good versus evil, or just a heart-stopping adventure packed into very few pages, this is the book for you! This might be a good read-aloud choice to get a reluctant independent reader hooked on an action story that has three other books following in the series. All are relatively short and have decent size print, which help a young reader avoid becoming overwhelmed visually before he or she even opens the book.